What can we learn from the latest claim of climate fatigue? A new set of international data has just come out from Mori and prompted the Daily Mail to claim that “‘Britons are suffering from ‘global warming fatigue’”. For loyal Mail readers, this won’t come as much of a surprise. A couple of months ago the Mail reported a poll that found agreement with climate science in the UK to be lower now than it’s been at any point since the polling began in 2006. But then for those who read other papers, especially the Guardian, there’s been plenty to suggest that agreement with climate science is still high, and desire for action remains strong. If anything, we might have thought that it’s been growing in recent months. So are the Mail twisting the facts to fit their expectations, or are they onto something? In his analysis, Neil at Carbon Brief makes several valid criticisms of the Mail’s interpretation. The poll asked respondents to identify their top three most important environmental issues, out of a list of 15. This is a long list to choose from, yet “global warming/climate change” was fourth in the UK (on 25%), itself ahead of other urgent and tangible issues like flooding and food supply. A second point Neil makes is that respondents were asked about environmental issues facing their country “today”. So they are prompted to think both locally and also in terms of issues that are already having an impact. Many people might think that climate change will be an immense crisis in the future, but that its impact is so far relatively unimportant. To Neil’s points, we could add the criticism that a claim of ‘global warming fatigue’ would require a change in attitudes. This poll doesn’t purport to show any change in attitudes. So there are good reasons to be wary about the Mail’s analysis. But for all that, we shouldn’t dismiss entirely the conclusions. A nice little paper was published last month in Nature Climate Change, which needs to be taken seriously by anyone campaigning on climate change. 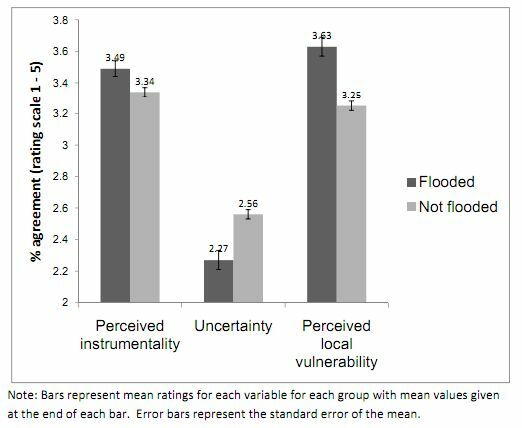 The paper draws on the 2010 poll by the Understanding Risk Group, and shows that “those who report experience of flooding express more concern over climate change, see it as less uncertain and feel more confident that their actions will have an effect on climate change”, and that “these perceptual differences also translate into a greater willingness to save energy to mitigate climate change”. That is, people who’ve had first-hand experience of something that could be attributed to climate change, care more about it and are more willing to act to stop it. Nowhere is the gap vast, but it’s always statistically significant. The message is clear: personal experience of the impact of extreme weather makes people more likely to think that climate change is worth tackling, and that it can be tackled. All of which is a pretty clear lesson for anyone campaigning on climate change. Consider this plausible scenario. An airline’s new poll finds that most people want airport capacity to be increased. 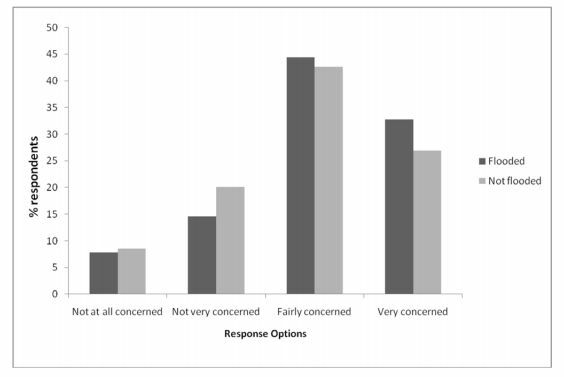 Two weeks later an environmental NGO announces that their own poll has found two-thirds oppose airport expansion. Both polls are conducted by reputable agencies, and both interviewed representative samples of over 1,000 people. How can we reconcile these two polls, and how should journalists report them? The problem is not that polling is inherently untrustworthy. Conducting a poll of 1,000 randomly chosen people means speaking to about 0.002% of the UK adult population. Yet the results are so reliable that, 19 times out of 20, the result you get will be within 3 percentage points of the result you would get if you asked every single person in the country. UK Polling Report offer a good explanation for why this is the case. Alternatively, if wading through probabilities isn’t your thing, just consider YouGov’s five most recent political polls. For each, they interviewed over 2,000 different people; the proportion who said they would vote Labour were, respectively, 44%, 42%, 45%, 42%, 42%. If polling itself is untrustworthy, the consistency in these results would require either quite a coincidence or a grand conspiracy. And for anyone tempted to call it a fix, just remember the outraged reaction when, after the second leaders’ debate last year, YouGov’s instant poll found that Cameron ‘won’. It would be a twisted conspiracy indeed if YouGov rigged polls for the Tories last year, and are now doing so in favour of Labour.